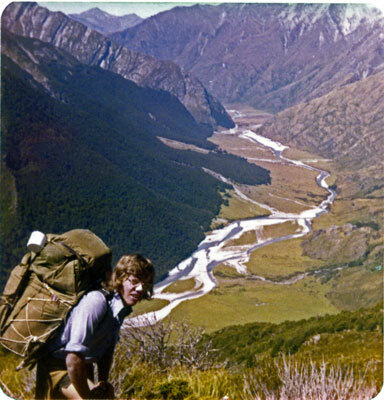 This article about a trip across Cascade Saddle from the Matukituki valley in New Zealand was first written for the MUMC magazine Mountaineering in 1975 by a youthful Bogong owner Neil Blundy. 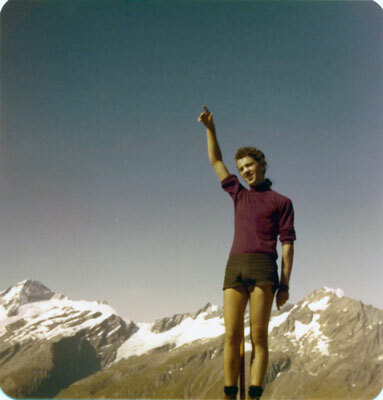 It was a time of long hair, short shorts, bravado and basic equipment. One thing remains the same, a love of walking in spectacular mountain country. For a brief description of this route see the New Zealand Dept of Conservation site. Please note this is not a route to be undertaken lightly, there have been a number of fatalities over the years including some recently. See warning. However Cascade Saddle and its superb view of Mt Aspiring and the Dart Glacier can be safely reached as a side trip from the very popular Rees- Dart walk. A description of this walk including the side trip can be found in the Lonely Planet guide Hiking In New Zealand. 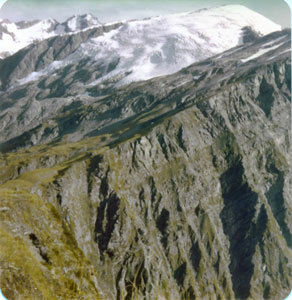 The route over Cascade Saddle from the Matukituki is also described in this book. Moir's Guide North describes the walk in full plus a huge variety of walks and routes throughout this region and is highly recommended for serious walkers. The Land Rover lurches as it winds up the rough road of the Matukituki River valley. Up ahead the peaks of Aspiring and Avalanche tower upwards, impressive citadels of ice and rock. The climbers chatter excitedly about such high peaks while David and I absorb the sun drenched scenery. The Rover driver is farewelled at Raspberry Hut, and with heavy packs we set out on foot. The walk up the grassy flats of the valley is delightful in the extreme. Lunchtime is spent basking in the sun on the river bank. The river is the grey-blue colour so peculiar to New Zealand rivers. Its bed is littered with schist boulders. Boots are turned to silver as they become encrusted with shiny mica from the schist. Aspiring Hut is reached in the early afternoon, but we continue a short way to camp by a small creek. Laden with gear the climbers continue up the valley; Mt. Aspiring itself their ultimate goal. The remainder of the day is whittled away relaxing in this most beautiful of valleys. Some grazing cattle wander our way and somehow the chill of the gathering gloom is kept at bay by the warm glow of the camp fire. 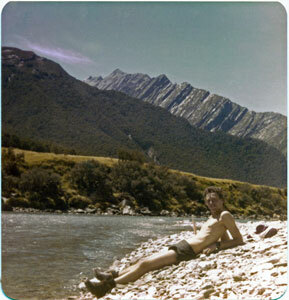 Aspiring Hut; relaxing by the Matukituki River. It is eleven o'clock, and a clear morning, and we are off on the track over Cascade saddle. We climb steeply through forest on the western flank of the valley for three hours before stopping for lunch. Soon afterward the forest abruptly gives way to tussock and we are treated to glorious views of the Matukituki far below and Mt. Aspiring rising to the north. This stirring scene acts as a constant backdrop as we toil upwards under the hot sun for the rest of the afternoon. The route is marked with orange stakes and each one becomes a goal in itself as unfit bodies struggle on under overloaded packs. Our water supply is soon all but eliminated, then a deep cleft of snow from the previous winter is found. The icy water flowing from its snout is delicious. The grade steepens and we are scrambling on rock. I feel unstable with my heavy pack and imagine myself slipping and falling down the many feet to the treeline far below. We are unsure how far it is to the top. Nervous eyes rake the sky for signs of approaching cloud, this place would be treacherous when wet. I am, as the rock climbers say, a bit gripped. Dave, on only his second bushwalk, mutters some choice phrases about my selection of beginners' walks. Thighs aching and quivering we plod on chasing the eternal orange stakes. The angle eases slightly. We move on a bit and an orange marker comes into view. "Hey, I think it is!" "You ripper!" Lunacy takes hold and we run the last thirty yards to the marker, only to collapse completely shattered on reaching it. We soon recover and realise the impressive sight confronting us now that we have attained the ridge. The Matukituki at our backs as ever, we now stare down into the immense rock basin of Cascade Burn, Mt. Ansted at its head. The walls of the basin are split by ribbons of water plunging to the valley floor. 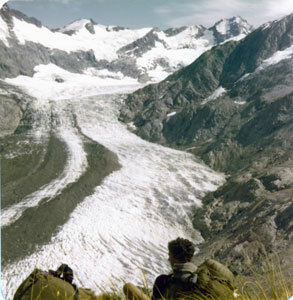 Further westward a ring of mountains forms a classic amphitheatre that gathers snow to create the Dart Glacier. It is getting late, so we descend to Cascade Burn to camp. You can see what Neil looks like now, click here. More kilos, less hair, but still with a pack on the back! Evening settles; still, serene. I feel the soothing of the soul that only places and times like this provide. A short walk by Cascade Burn and the solitude of these magnificent mountains encloses, embraces, until it presses, overpowering. Some chamois play high on the crags, silhouetted against the darkening sky. Another beautiful morning. We cast a last lingering glance to the Matukituki from Cascade Saddle then set off down the Dart valley. A traverse on a huge expanse of rock shingle high above the Dart Glacier takes us past the level of the ice and we drop to the valley floor. Conditions are made unpleasant by a strong wind whipping up dust from the glacier rubble, and we hurry to get below the moraines. The sky begins to cloud over as the Dart River is followed to Dart Hut; it looks as though we can expect rain. Dave on top of the "Pylon" Mt Aspiring at lower left; Cascade Saddle; overlooking the Dart Glacier. A wet night gives way to an equally wet morning. The next two days are spent completing the walk down the Dart to Lake Wakatipu in constant rain. Unlike the placid Matukituki, the Dart is an angry river, heavily laden with sediment, cement grey, it flows rapidly on its way to the lake. The lower Dart is also a haven of the accursed sand fly. Not deterred by rain these intolerant beasties attack any exposed skin in swarms. Insect repellent proves an ineffective weapon against this onslaught. 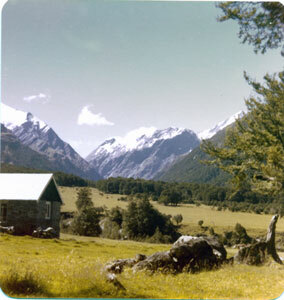 The next day sees a twelve mile road bash to Glenorchy. The mist is reluctantly lifting from the ranges, and freshly saturated with water they appear like fine lacework with the myriad waterfalls gushing down their slopes. Temporarily we are tempted to return up the valley, but our tired feet and empty stomachs prove dominant. The Glenorchy pub is approached in voracious anticipation of a good counter lunch. However, much to our dismay the sadistic barman announces a complete sell-out of counter meals, the excuse an unexpected rush of five hungry bushies who appeared from the wilds and ate two lunches each. Thus we must content ourselves with the Australian gourmets' delight of a hot pie and sauce. At least there is beer, even if only the local brew. If five people can eat them out of food, what are the chances of two drinking them out of beer? Well, it certainly won't be for want of trying. Why Do You Need Gaiters?